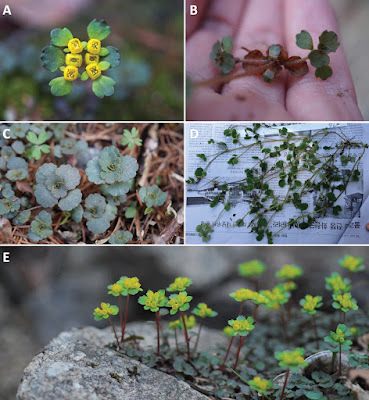 in Kim, Cho, Lee, Kang, et al., 2018. This study describes and illustrates Chrysosplenium ramosissimum, a new plant species from Mt. Seonjaryeong, located in the central region of the Korean Peninsula. The species is most similar to C. valdepilosum but is readily distinguishable by the presence of yellowish-green bracteal leaves during flowering, highly branched sterile branches, shiny silvery dots on sterile branch leaves and larger tubercles on the seed coat. Figure 1. 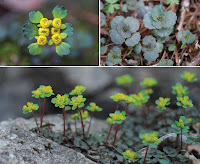 Chrysosplenium ramosissimum Y.I.Kim & Y.D.Kim. 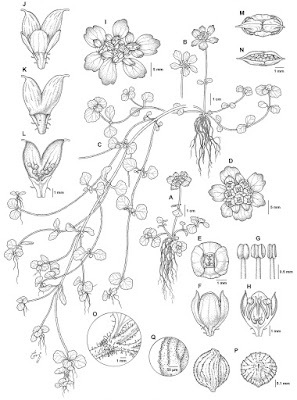 A Flowering individual B fruiting individual C sterile branch habit after fruiting D inflorescence and bracteal leaves E–F flower G stamen at various stages H flower longitudinal section I infructescence and bracteal leaves J capsule with persistent sepals K capsule, sepals removed L capsule, longitudinal section M capsule, before dehiscence (top view) N capsule, after dehiscence (top view) O node of sterile branch, enlarged P seed, side view (left), top view (right) Q seed coat, enlarged. Figure 2. 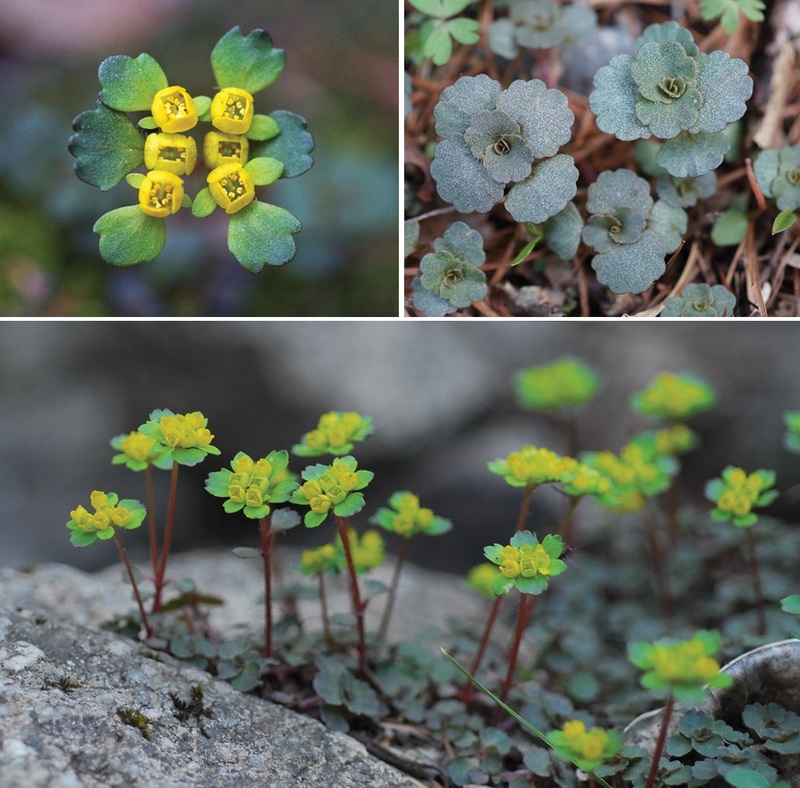 Chrysosplenium ramosissimum Y.I.Kim & Y.D.Kim. A Inflorescence with bracteal leaves B sterile branches and basal leaves during flowering with withered basal leaves C sterile branch leaves with shiny silvery spots during flowering D sterile branch after fruiting E plant habit during flowering. 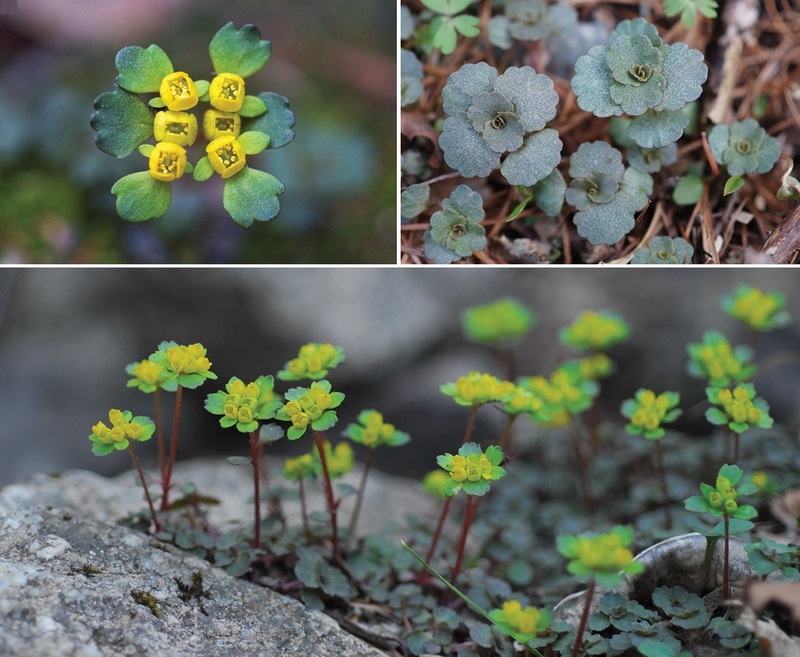 Chrysosplenium ramosissimum Y.I.Kim & Y.D.Kim, sp. nov. 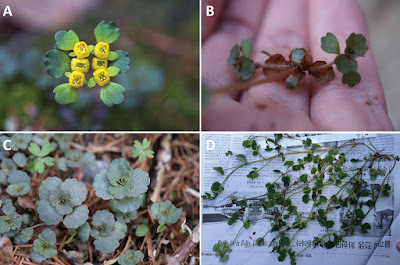 Diagnosis: Chrysosplenium ramosissimum is most similar to the sympatric species C. valdepilosum, but the former is readily distinguishable by the presence of yellowish-green (vs. bright yellow) bracteal leaves during flowering, highly branched and elongated sterile branches after fruiting (Fig. 4), shiny silvery dots on sterile branch leaves and larger tubercles on the seed coat (Fig. 3). 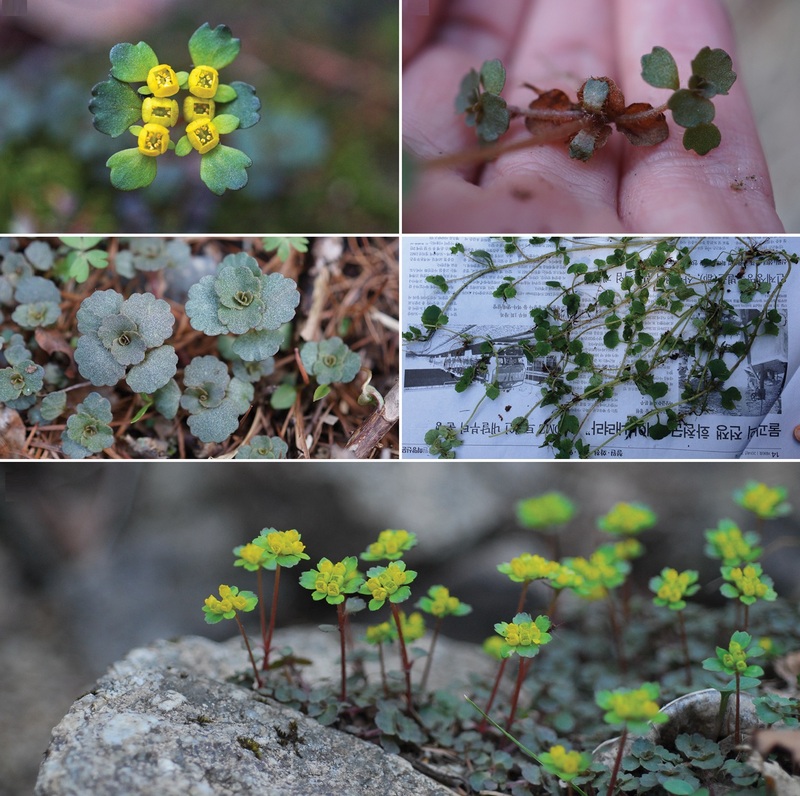 Distribution: Chrysosplenium ramosissimum is only known to exist on Mt. Seonjaryeong in Gangwon-do, Korea, at an elevation of 630–910 m. To date, only one population of approximately 2,000 individuals has been discovered, near a small creek. In the absence of additional data, we presently score it as Data Deficient (DD), according to the IUCN Red List criteria (IUCN 2001). Ecology: Chrysosplenium ramosissimum occurs in deciduous forests of mountain valleys, where it grows in humid and semi-shaded areas near small creeks along with Quercus mongolica Fisch. ex Ledeb., Fraxinus rhynchophylla Hance and Acer buergerianum Miq. 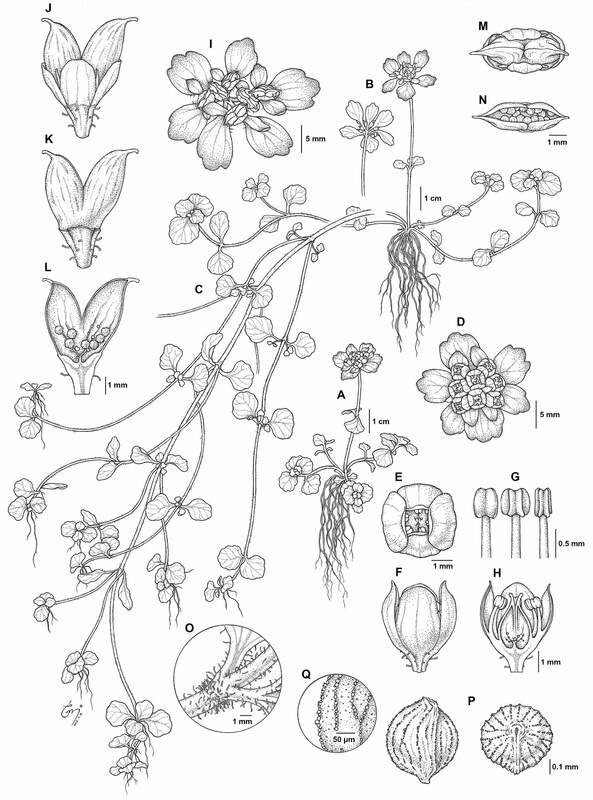 The flowering period of this species is late March to early May and the fruiting period is late May to early July. Etymology: The specific epithet of the new species refers to the highly branched sterile branches after fruiting.